Rightfully we are all very proud of our home ground on Tulip St and our very homely clubhouse. Recently there has been a feeling in our Club from some people that we run a dangerous risk of losing control of this facility over the winter months (1 April – 30 Sept) if we are not present during those months. To this end, Sandringham re-entered the DBA competition two seasons ago and had initial success in the C1 Grade. Last season was more of a struggle as the quality of the competition improved and our playing group altered. We have since lost further players with Ormond re-entering the DBA. The Club is wanting to attract some more of our summer season players into the winter based team. See it as a chance to relax after a hard summer and also get to play positions previously out of reach. Fees are very reasonable and training is optional on every Wednesday evening at 6pm….both hitting and fielding under lights. 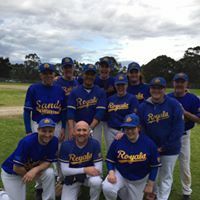 Your club needs your help, so please consider making Sandringham your winter baseball home.